The following list was taken from the book "Sourdough Sky", a pictorial history of flights and flyers in the Bush Country, by Stephen E. Mills and James W. Phillips (Bonanza Books, 1960). The list concerns a time span of 1923 to 1938. I would welcome additional information about these carriers (dates, anecdotes, names and places, etc.) and esspecially would welcome photos, thus writing online history on these commercial aviation pioneers. All material will be published with credit to the sender and/or provider. Other information and photos, such as on early Alaska (or Canadian) carriers not neccessarily in the 1923-1938 time frame, will be welcomed too (including material from privat bush pilots). As long as it can be classified as "historical" and will add to the understanding of bush flying and commercial aviation in Canada and Alaska before, let's say, GPS was invented. "Nat (my father) was the 13th of the first 100 bushpilots in Alaska, initially flying out of Valdez, beginning in 1932/33, then moving to Fairbanks, Anchorage, and settling in Bethel in 1935, and, for awhile, was the first pilot to be based there. 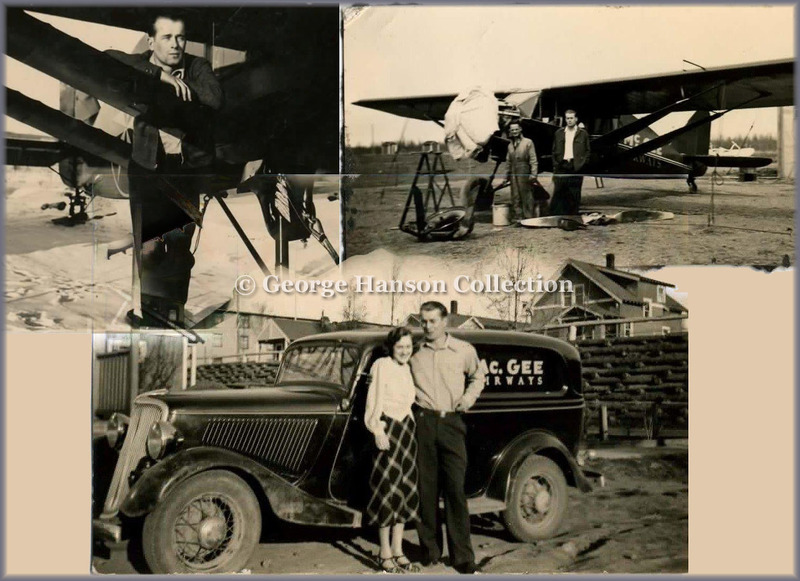 He flew a Waco YKS, and later, when he was awarded a mail contract for villages along the lower Kuskokwim & Yukon, and to Goodnews Bay, he had a Bellanca Skyrocket and a Stinson Reliant leased from Alaska Airlines. In 1948, he bought one of the first Cessna 170s with fabric wings. He flew year 'round; floats, skis, wheels. As for cargo; well, he flew anything that could fit in the airplane, including airsick sled dogs. Employees: He had native help on the ground, and I think Johnny Walatka may have flown with him for awhile. The pilot I remember best was Ray Miller, now dead, who later flew 737s for Wien in the 1960s, and was first officer on the only airliner in Alaska to be hijacked to Cuba. That was in 1968. The hijacking attempt ended when the airliner landed in Vancouver B.C. to refuel, and the highjacker, a disturbed young man with a .22, surrendered to the Canadian authorities. Ray later told my family: "I tried to talk him out of giving himself up. I'd never seen Cuba." Only a bushpilot would think like that. In the late 40s, when Ray Petersen was organizing Northern Consolidated, Nat's flying service was supposed to be part of the consortium, but the deal fell through for reasons which were never explained to me. Ray had flown out of Bethel for awhile. In 1950, Nat closed the business in Bethel after being awarded a contract to map DEW line radar sites for the then U.S. Coast & Geodetic Survey, which was working in concert with the Air Force. Nat bought 14 Super Cubs and was initially based on St. Lawrence Island. He later established his headquarters on Lake Hood. The Air Force/C&GS contract was terminated in 1954 when Rick Helicopters of Anchorage stated it could finish the job in less time. This was at the height of the Cold War and speed was of the essence to the goverment." In 1934 Woodley Airways was awarded a mailcontract and acquired Travel Air S-6000s to operate between its base Anchorage and Kodiak, Bristol Bay and Kuskokwin. Later on it received the required permit to carry passengers along with the mail. 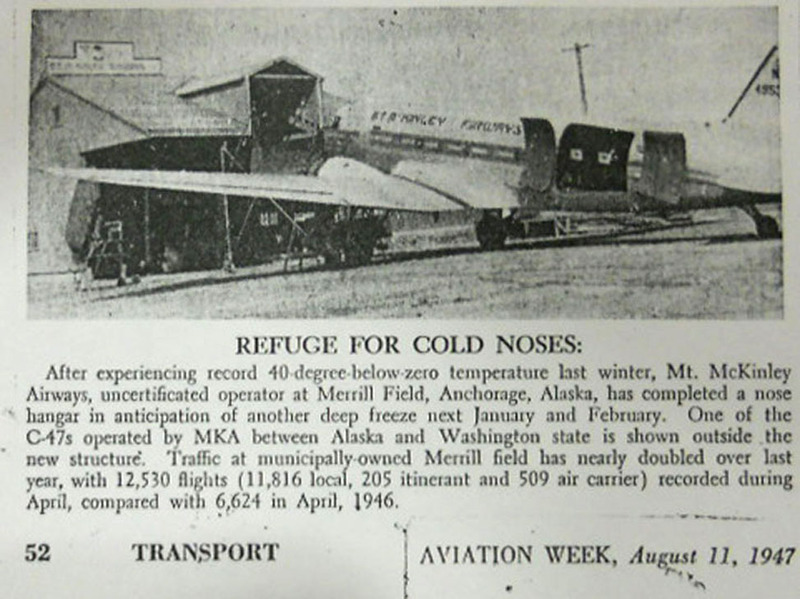 The war effort brought modern airfields to Alaska and aviation could grow. To attract investors, the company became a partnership on 01Jan44 and was incorporated on 23Aug45 at the end of WW2. With new investors, a new name was chosen: Pacific Northern Airlines (PNA). And Boeing 247D airliners had joined the fleet (they seated 10 passengers). In 1946 the first of 4 Douglas DC-3D's (N37465, c/n 42955) joined the fleet; it could seat 21 passengers. Later 2 ex-military C-47s would join the fleet as well. On 20Jun46 the Civil Aeronautics Board (CAB) awarded PNA a new route: Achorage - Cordova - Yakutat - Juneau. Since there were no roads linking these cities, this was a vital connection for the territory. PNA's rivals in the area were: Alaska Airlines, Pan American World Airways and Northwest Airlines. In 1950 PNA was awarded the routes Portland,OR - Seattle,WA - Anchorage,AK. In 1953 Seattle/Tacoma - Juneau followed. The company needed long range airliners for these routes and bought 3 ex-US Army Air Force (USAAF) C-54s and an ex-Navy R5D-1 (C-54A). 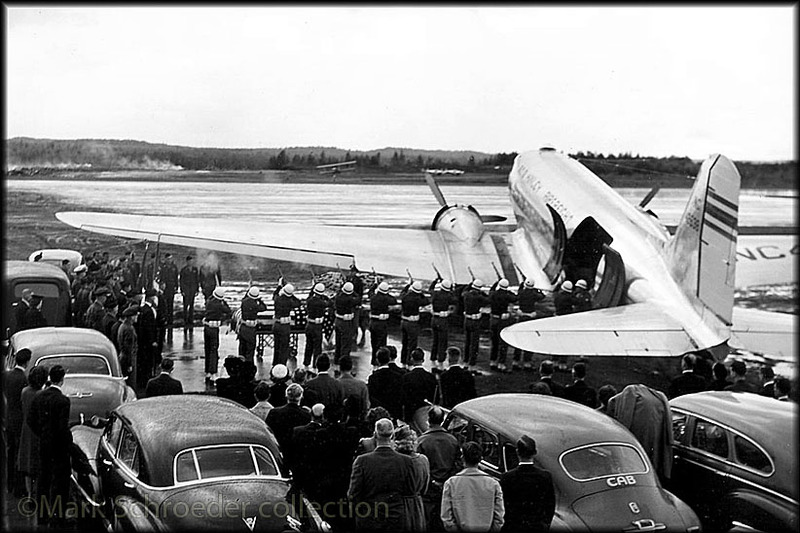 The first DC-4 was N3934C, acquired from Aerovias Guest (had previously operated in Mexica, as XA-HOA) and it arrived in July 1951. But when Northwest Airlines operated the Boeing 377 on the long haul routes, the DC-4 came out too slow and PNA needed a faster plane to compete. Woodley found Delta Airlines disposing of Lockheed L.749A Constellations and 3 were bought: N86524 (c/n 2660), N86523 (c/n 2659) and N86525 (c/n 2662). N86524 arrived on 15Mar55, the 2 others followed in April. They did well on the SEA-ANC route, advertised as the PNA Constellation Flagliner Service with a speed of 300 mph (a cruising speed of 250 mph was more realistic). The 749A's were also assigned to the SEA-Ketchikan (Annette Island)-Juneau route; the Douglas DC-4s flew on the less competitive Juneau-ANC and Juneau-Yakutat-Cordova route. 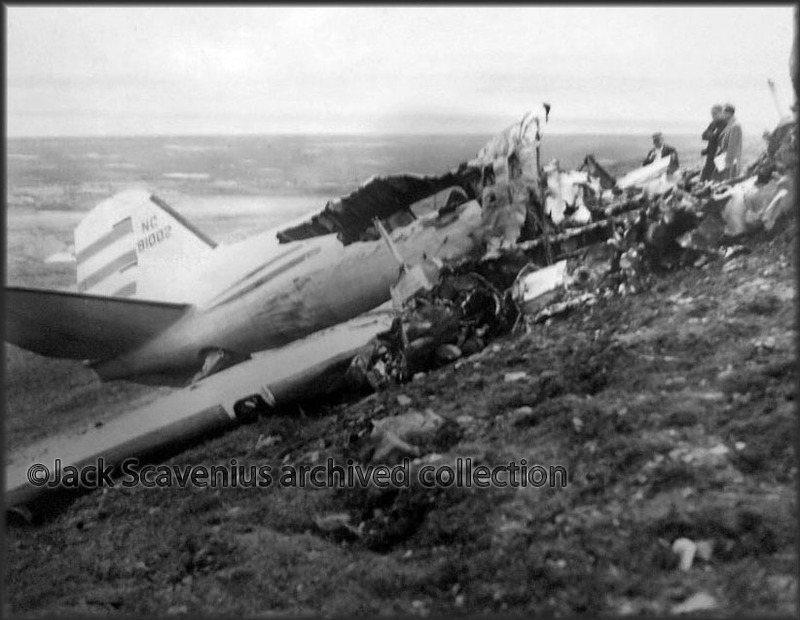 PNA suffered only 1 accident with loss of life in their history: L.749A N1554V (c/n 2555) crashed on flight 201 from Cordova to Anchorage on 14Jun60; the Connie crashed into Mt.Gilbert, 9 passengers and 5 crew perished. The competition moved into the jet age and PNA had to follow. Nothwest Orient Airlines introduced the Douglas DC-8 on the Seattle/Tacoma-Anchorage-Tokyo route in 1960. alaska Airlines introduced the Convair CV880 jets in 1961. PNA ordered the Boeing 720 in 1961 and saw delivery in 1962 (N720V c/n 18376 and N720W c/n 18377). The 720 was 02hr45 faster than the Connie on the SEA-ANC route. A 3rd 720 followed in 1966 (N7081, c/n 18042). But the increased competition forced Arthur Woodley to merge with Western Airlines. The latter had no routes to Alaska and both companies shared a connection point in Seattle,WA. PNA was absorbed into Western A/L on 01Jul67 as its Alaska Division. "Just a note, to add Golden North Airways to the list. In 1947 I was just a kid and had my first airplane ride from Seattle to Fairbanks in a Lavery Airways DC-3, and when we left in 1950 we flew back to Seattle in a Golden North Airways C-46. I think it took all night and I remember a fuel stop in Yakutat." Aviation Safety Network has an accident report on a Curtiss C-46A Commando at Annette Island,Alaska on 22Feb49; tailnbr unknown. However, www.aerotransport.org specifies one aircraft for the fleet: C-46A N92854 cn250 ex/ USAF 43-47179; but this aircraft is stated to have moved on to Johnson FS. I would welcome more details, and dates of operation, of this company. "I ran across your website while doing a search for information on Golden North Airways. My father flew for this 'non-sched' carrier for a period of time during a period of transition from Northwest Airlines / ATC (1942-1948) to Pacific Northern Airlines / WAL (1954 -1980). During this period of transition he also flew for MK construction in Alaska, on their LB30's. I have his log books for his entire career, showing the entries - dates and N numbers of the corresponding aircraft. With respect to GNA, I have a couple of newspaper articles from Seattle new papers documenting the arrival of GNA flights in Seattle that he flew. One with a shipment of gold from the mines, and on another occasion with two polar bear cubs and their Eskimo caretaker enroute to a zoo back east! He also told of on one occasion inadvertently forgetting about a bag of gold on the floor in the cockpit. Seems that they had run into particularly bad weather and strong winds while enroute south, this on top of a late departure. They arrived in Seattle in the middle of the night, several hours late, and extremely tired from the trip. Usually an armored car and two guards met them and took charge of the gold. As they were extremely late, there was no armored car and subsequently dad and the co-pilot forgot about the gold ! After the few passengers they had on board had deplaned, they secured the aircraft and went home. Dad had been in bed for several hours when he got a call from operations wanting to know where the gold was. Dad had to sheepishly admit that, being dog tired, they had forgotten about the gold, and that as far as he knew it was still laying on the floor in the cockpit behind the left seat. Fortunately it still was and all was OK ! For the period recorded as 28Mar1950 to 04Oct1950 Dad only had one aircraft: 'N92854 / Curtiss C-46 C electric props - continually used – 78 trips'. Southern terminus was usually BFI. Crew names Brenner, Evans, Bray, McAuly, Larson, Morrison, Geddis. 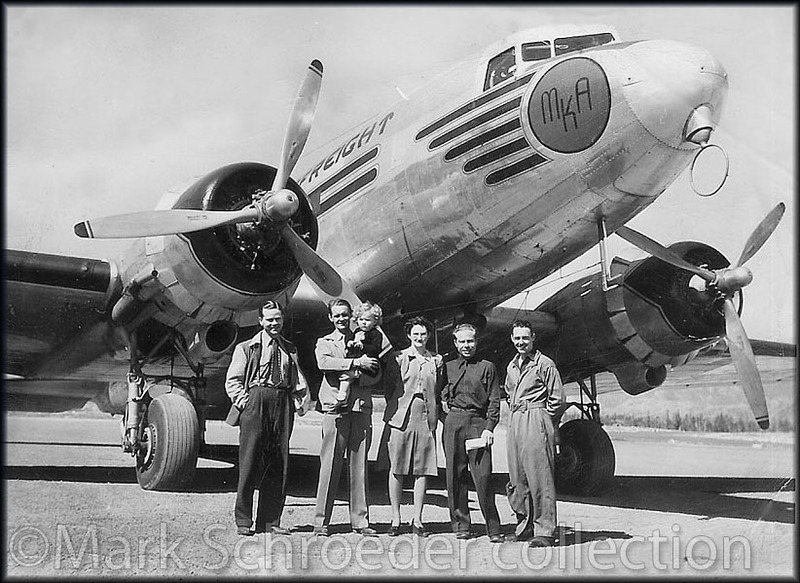 He evidently abruptly quit GNA and started with ATA 06Oct50 and flew for them intermittently (again Curtiss C46 Commando's: N5076N, N1300N and N13002N – all Hamilton Standard props) and MK company (Morrison Knutsen construction – DC3 N2075N). During December of 1950, Jan and half of Feb1951 he flew exclusively for an outfit called New England - again BFI to Alaska, with C-46 N9403H and N1309V, both Hamilton Standard props. He started full time for Morrison Knutsen 20Feb1951 and flew LB30 68735 until starting with PNA in July of 1951. He also flew for MK Construction during the construction season of 1949. After the PNA / WAL merger Dad reverted to flying Captain on the Connies, as he had been flying right seat on PNA's 720's, but did not have the seniority to hold the seat initially after the merger. He operated the last flight with PNA's Connies for WAL. He subsequently went back to the Boeing 720 and after a few months took his Captain checkride. He continued to fly the 720 / 707 until his retirement on Jan 5, 1980. He had been elgible for several years to move to the DC-10, but chose not to. After Dad retired he often said that he felt he had flown during the best period of commercial aviation; and certainly the most enjoyable. I would have to agree. He enjoyed flying in Alaska and the great northwest the most. He spent most of his NWA time in Alaska, and of course with PNA, and bid Alaska schedules with WAL whenever possible." 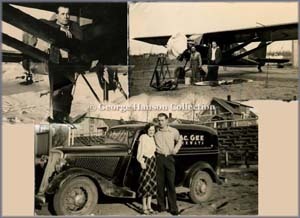 My Grandfather, Jack Peck, began by starting an airline called Peck & Rice Airlines in the 1930s, which I believe flew mail, passengers, and cargo in and around the Bethel area. After this he flew for a time for Alaska Airlines, and then started Alaska Aeronautical (AAI), at the same time operating a Cessna dealership out of Lake Hood. This lasted up until the early 1970s when he sold AAI. More on Jack Peck can be read on Cordova Airlines. My father and brother both worked for some of Alaska's early airlines. My father, Virgil Hanson, was an early 'avionics' technician, as was my brother Alan. Dad was responsible for installing and maintaining some of the early navigation stations in Alaska. He worked for McGee, Star and Alaska Airlines as they progressed from McGee to Alaska. He also worked for Pan Am. Alan worked for Cordova Airlines, then moved to Northern Consolidated which later became Wien. We lived across from Merrill Field in Anchorage during WW11 and I can still remember some of it, although I was only 5 years old in 1944. I worked in plumbing & heating and ran the electric utility in Deadhorse (Prudhoe Bay) from the mid- 1970's to the late- 1980's. My father was AK bush pilot from 1934 - 1941. He flew for Alaska Exploration & Mining Co., McGee Airways, founded Bering Sea Airways, then flew for Woodley Airways & Star Air Lines. I saw that your list did not include an airline called Westair Transport. This is a significant airline for several reasons. It went out of business in the early 1960's. Westair operated from Seattle, Washington from 1951 until it's demise. In 1961 it hauled more freight than all other air carriers in Alaska, combined. This led to lawsuit headed by Bob Reeve, of Reeve Aluetian Airways. The lawsuit claimed Westair had created unfair competition and jeopardized the well being of government mail carriers, such as his own airline. Westair was a non scheduled airline that flew both freight and passengers from Alaska, to Hawaii, Seattle and beyond. Their cetificate allowed them to fly anywhere in the world. Westair was operating primarily C-46's (from 4-6 year round), two DC 4's and a C-119 that was the first successful jet pack in Alaska. PNA, a Cordova Airlines, found the lawsuit frivolous. However, the courts sided with Mr. Reeve and Westair suddenly had to find business elsewhere. They pursued business in Europe and North America but finally had to close their business down due to tax issues. In 1991, the former president of Westair, Tommy Thompson, received a letter from the state of Alaska informing him that the lawsuit that had kicked him out of Alaska was indeed frivolous. He was given permission to seek damages from the airlines that had perpetrated the lawsuit. However, at this point in time Mr. Thompson was in his early seventies and felt no fire in him to pursue and restructure a new airline. He did manage, however, to form an air carrier know as Sky Van Airways, after the demise of Westair. It ran off a Part 45 certificate that only allowed freight. This airline functioned in Alaska for about seven years and then was sold to a California business group that dissolved the company in the late 60's. Westair was known throughout the Alaska scenery. They had the food and supply contract for the DEW LINE (Radar Defense line set up across Alaska for National Defense,) throughout its time in Alaska. 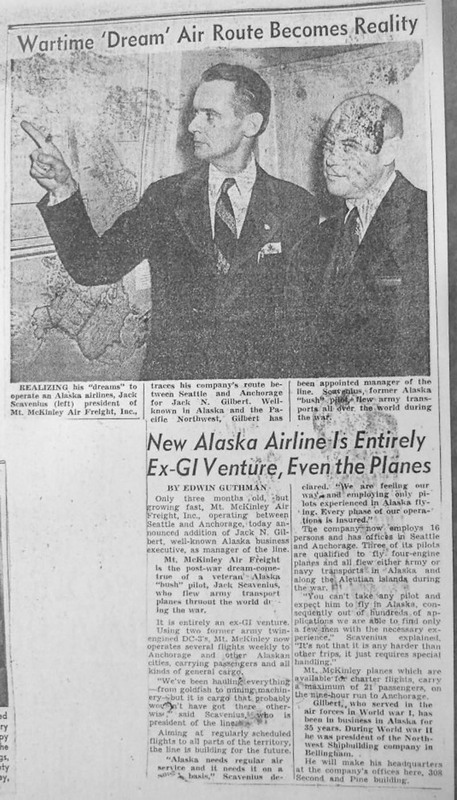 Mr. Reeve, of whom the lawsuit finally forced Westair out of Alaska, owned several C-46's that Westair had sold or leased to him over the years of business competition. In 1959 Westair received the National Safety award for quality control in the air and on the ground. Westair was on the brink of becoming a major force in the airline industry. "My first job out of college in 1971 was fueling aircraft at Anchorage International Airport for Standard Oil. One of our customers was Reeve Aleutian Airways. Reeve had two Lockheed Electra,s with turbine engines that used jet fuel. Most of our fueling was done with hydrant trucks. These trucks had filters, meters, valves and hoses that connected to hydrant fittings in pits that were located at the aircraft parking areas. One morning I went to fuel a Reeve Electra and discovered that it was not parked properly. As a result, the hoses on my truck could not reach the aircraft. This happened about once a week and was a constant source of friction between the fuelers and the Reeve ground crews. Since I could not hook up the hydrant truck I had to go back to the bulk plant, load a tanker truck and return to the ramp. The tanker was an ancient White that was miserable to back. I had to spot it within inches of the aircraft after backing through a maze of compressor trucks, baggage carts, catering trucks and other vehicles. All of this was done in bad light with a wet windshield and vibrating mirrors. If my truck hit the aircraft I would have been fired. He had an eye patch and was hard of hearing after all of those years sitting behind radial engines. He was a fearsome spectacle. Pappy owned Reeve Airways, lock stock and barrel - it was a sole proprietorship, and he ran it like he had run his operations all his life - with an iron fist. He had noticed that his flight had not departed on time so he came out to determine the cause. He quickly learned that the delay was because the aircraft had not been fueled, and of course I was the culprit! Pappy went into attack mode the instant I got out of the truck cab. First off, he demanded to know why the (expletives deleted) I was backing my (expletives deleted) truck so close to his (expletives deleted) airplane. Second, he wanted know where I had been and why I had delayed the flight, and -third- he wanted to know why I was not using the 'other truck'? I pointed out the spotting marks on the ramp for the nose gear and the main gear and explained that if the aircraft was not parked in the correct location that the hoses from the 'other truck' would not reach the fueling port on the aircraft and that I had to go back to the plant to load the tanker which is why his flight was late. Pappy stared at me for a while and then walked off. Two years later I was working downtown for the U.S. Customs Service on Fifth Avenue. Pappy was semi-retired by then and had an office with windows looking out on Sixth Avenue. 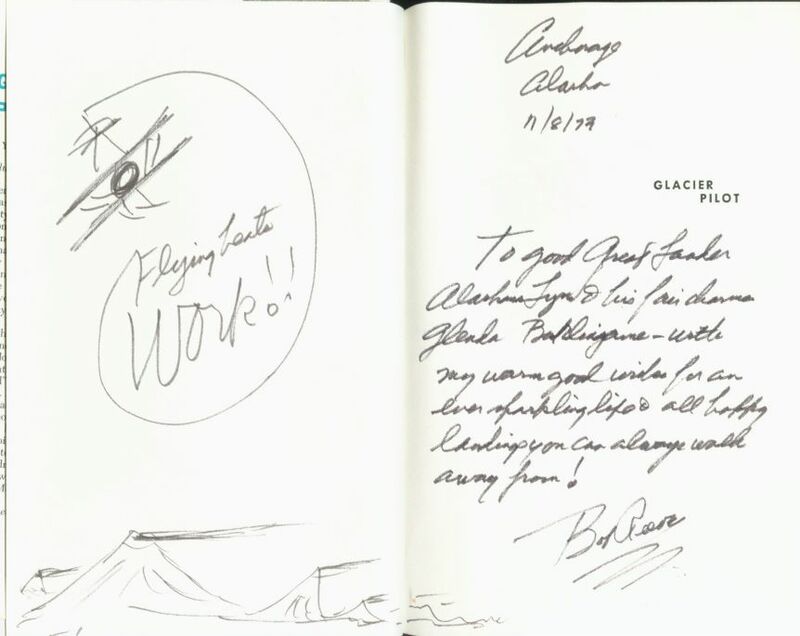 One day I bought his biography, Glacier Pilot by Beth Day, at the Book Cache and dropped by Pappy's office and asked him to autograph it. I could tell that he was happy to have the company, and he graciously autographed the book and even drew some sketches in it for me. I mentioned the fueling incident and he remembered it well. The inscription reads: 'Flying beats work!! Anchorage, Alaska 11/8/73. To good Great Lander Alaskan Lynn & his fair charmer (?) Glenda Burlingame - with my warm good wishes for an ever sparkling (?) life & all happy landings you can always walk away from! Bob Reeve"
"I was very interested in what you have on early Alaskan operators and your page on Cordova Airlines and Alaska Aeronautical Industries, which mentions a Jack Peck. I would welcome more information on Otter N98T, serial 181, which was involved with a Mr Peck. Your website mentions a Jack Peck who founded Alaska Aeronautical Industries. In April 1958 Otter N98T was bought by a Mr Vernon J. Peck who had an address in Saratoga, Florida and also an address in Anchorage, Alaska. The Otter was in Alaska. I wonder if this is the same man as Jack Peck? In August 1958 there was great drama when the Otter was flying from Alaska down to Seattle, when the engine failed. Fortunately it was on floats and could land on the water. It continued on to Seattle and then I have seen a photograph of it in Oakland, California in December 1958 on wheels. In January 1961 it was registered to Sea Airmotive (Seair) of Anchorage and operated by them until 1974, although it crashed a few times. 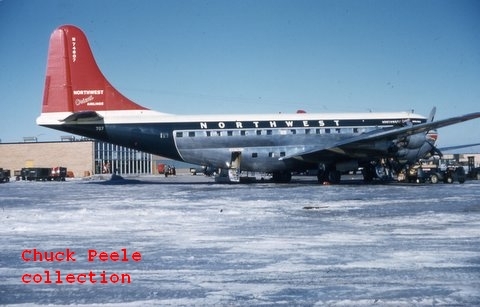 It was repaired and registered to a Richard V. Peck, and sold by him in March 1977 to Peninsula Airways of Anchorage. So, this Otter was very much involved with the Peck family, and I wonder if that is the same Jack Peck and his family which founded Alaska Aeronautical Industries and if your correspondents might have any more information on these people, Vernon J. Peck and Richard V. Peck and on this Otter?" 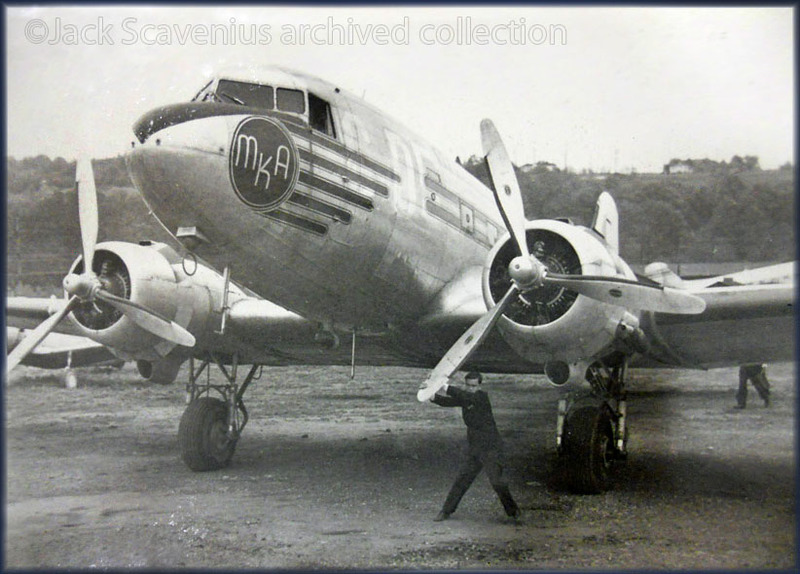 "MKA is Mt McKinley Air Freight Inc of Anchorage, Alaska; it operated two DC-3s NC49538 and NC74678." From 'DC-3 The First Seventy Years Vol. 1', page 232. 'FOUR ARE KILLED IN NOME CRASH. Nome, Alaska, Sept. 9 (UP) -- A blinding fog today was blamed for the death of four persons killed in the crash of a twin-engined cargo plane near here last night. Officials of the Mt. McKinley Air Freight Co., said the plane smashed into a hillside as it circled the Nome airfield in a ceiling zero fog. 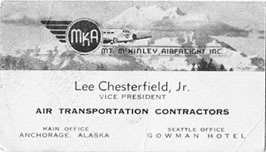 Airline Vice President LEE CHESTERFIELD, Anchorage. Pilot MARVIN L. PRATT, and his wife, of Bellingham, Wash. The plane was returning from an unscheduled round trip flight from Nome to Fairbanks when the crash occurred. More on the above aircraft, C-47A c/n 9700 (which continued to fly over decades), and photos from Mark Schroeder: Photos by Friends & Guests page 35. This appears to be a promotional photograph taken in 1946. 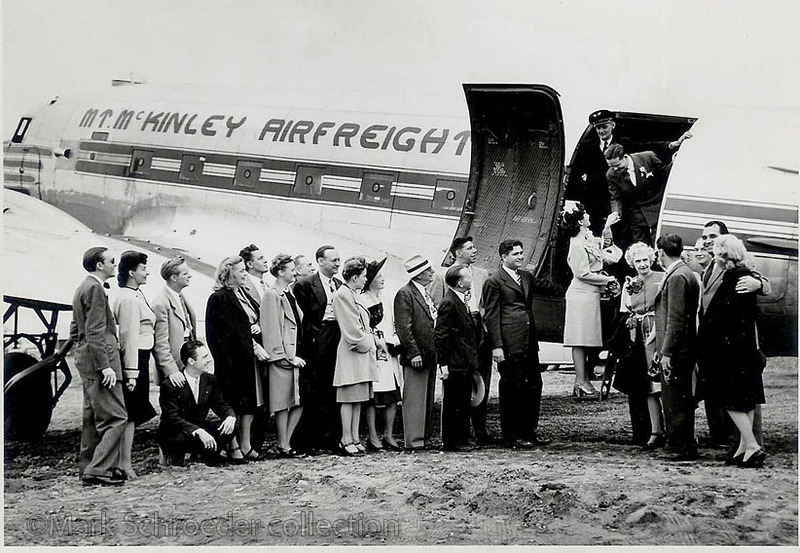 In the photograph of the group of people standing in front of the plane, Lee Chesterfield is on the far right. Also, a photograph of Lee Chesterfield 1918-1946. The funeral is that of Lee Chesterfield (President of MKA) and John Campbell, with a military rifle salute. Lee Chesterfield was the Vice President of Mt. 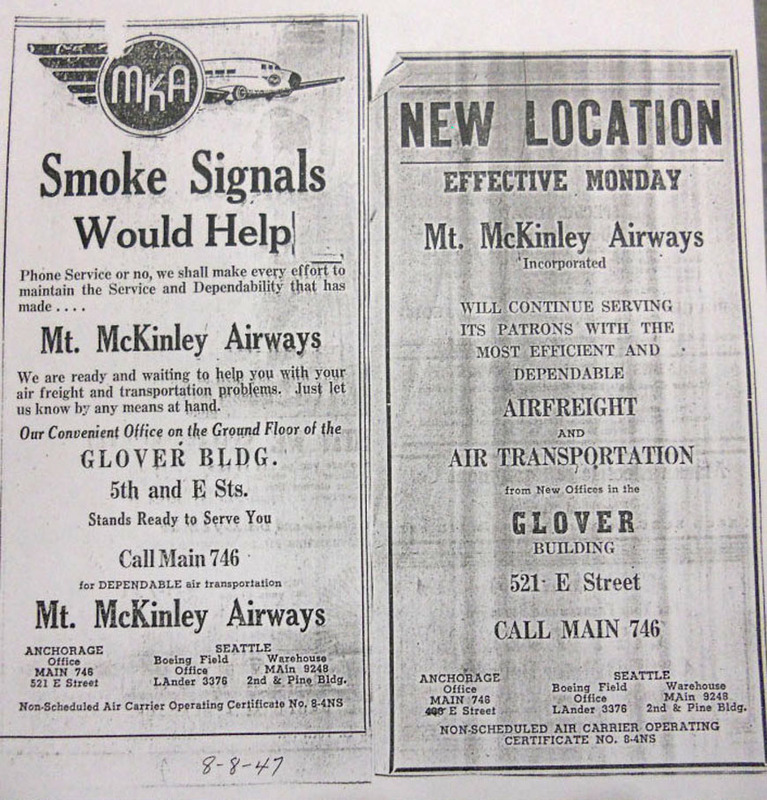 McKinley Air Freight. 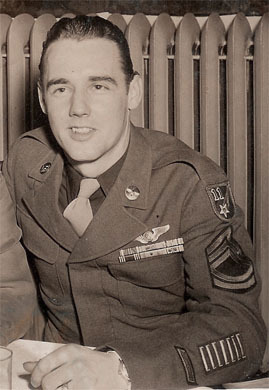 His service in the 11th AAF 42nd Troop Carrier Squadron as a Aerial Engineer on C-47's, C-60's and B-25's and love for flying left him well qualified for a post war business with the large transport planes. He is credited with more time in the air than any other enlisted member of the 11th Air Force - 2,700 hours. A Seattle native, he moved to Alaska after his discharge. 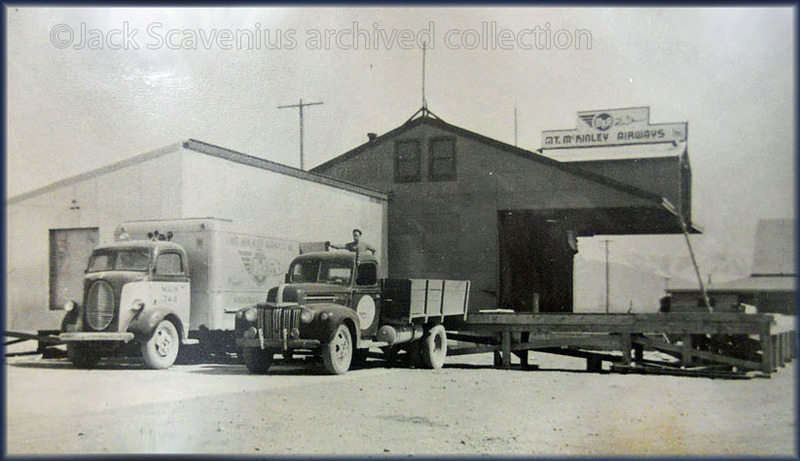 The company had two C-47 purchased as military surplus immediately following WW2. On 06Sep1946 Lee and three others took a business trip in one of the C-47 to gather winter supplies the company had stored in Nome. They arrived in Nome in dense fog and low on gas. The last report from the tragic flight to the Nome airfield control was at 11:18 am. Later that afternoon a miner sighted the wreckage in Anvil Mountain and reported it to the Army air base at Nome. Those killed in addition to Chesterfield were Pilot Capt. Marvin L. Pratt, 25 of Bellingham, WA, his wife Roberta, and co-pilot John Campbell, former Navy Aviator and resident of Anchorage. The plane plowed into the mountain with wing separation and burned. The crashed plane was a C-47A, originally USAAF 43-15761, registration number NC91002. Mt. 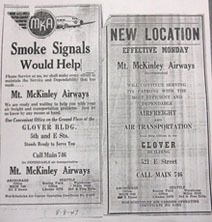 Mckinley Airfreight was in business another three years, ending business circa 1950. 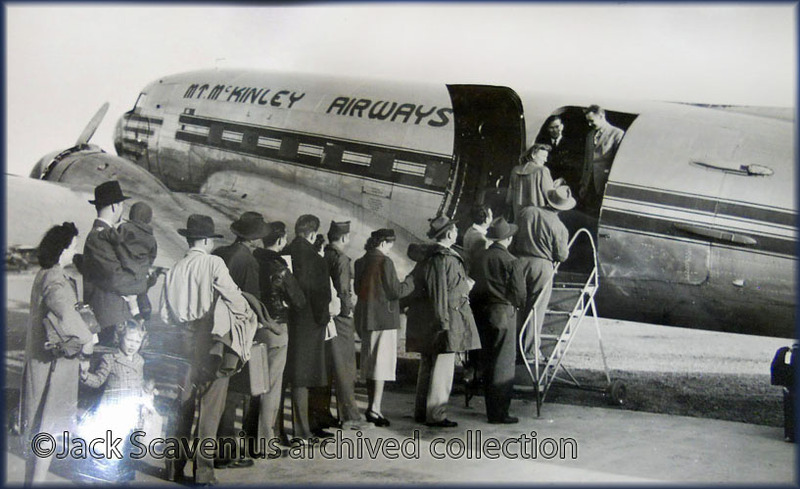 Mark: "Here are some more images of Mt McKinley Airways if you would like to add to your website. These items are from the archived collection of MKA president Jack Scavenius. Above and below the versatility of the Douglas DC-3 clearly shown, transporting passengers and / or cargo! Mark:"The old (USAAF) tail number of the C-47 is still visible next to the new registration number. 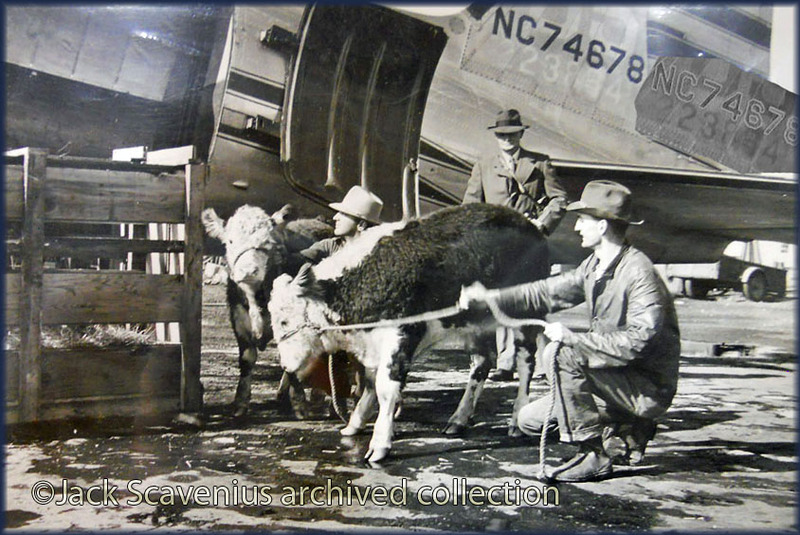 These cows are the first cattle to be flown to Alaska by air! 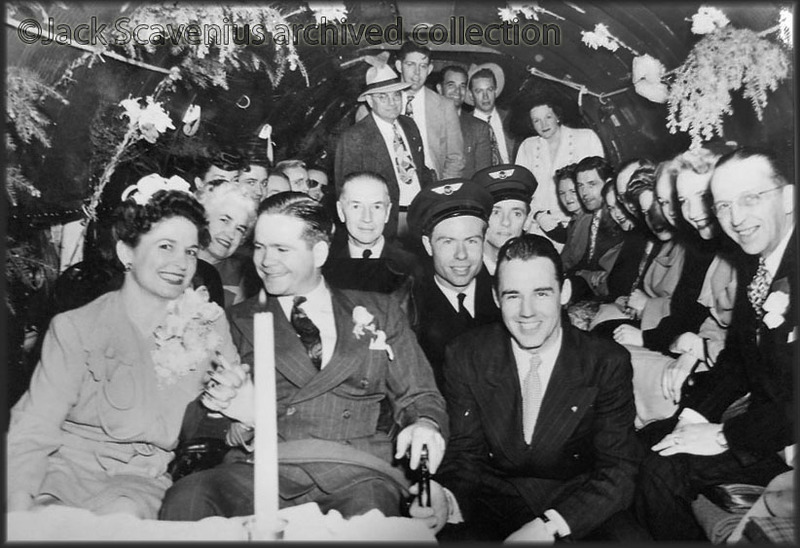 I added an enhanced image of the numbers..."
The DC-3 has even room for a wedding! Mark:"group of people inside the airplane is a wedding party. The group of peopleseen boarding the plane is the same party." 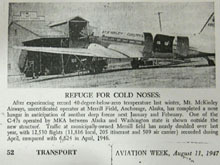 The nose hanger was located here in Anchorage at Merrill field. Interesting concept to keep the cockpit and engines from being exposed to the cold winter weather! The fleet shows many MKA airplanes. Interesting that the 91002 is in the front. The newspaper article states they started with two, this was barely a year later. Any help would be most appreciated. I am open to sharing anything I have on his airline as well as other Alaska Airlines for your website. Besides old newspaper archives, we are the only two sites that talk about his life online. Great job on your end! Mark: "So where I am getting all this stuff... I have a grouping of paperwork from Lee Chesterfield. It is someone complete of personal paperwork and pictures from the last few years of his life including USAAF papers, personal items, even his death certificate. I believe it came from his mother. Alaska, and I bought this group several years ago. It is still in my possession. The crashed plane number I got from http://www.aerotransport.org/"
Merged with Alaska Airlines in 1968"
Paul Weston brought up more names I could find little of on the Internet: Gifford & Associates, Kodiak Airways, Western Alaska Airways (these last two merged mid-1970s I think). Details, data, anecdotes welcomed ! "I enjoyed reading through your web site about aviation history, particularly the section about Alaskan airlines. On the portion in which you write about Nat Browne Air Services, it states that you had contact with Mike Browne, Nathan Browne’s son. I realize this communication was from nearly ten years ago, but I was wondering if you might still have Mike’s contact information and, if so, if you would be willing to share it with me. Our museum, the Valdez Museum & Historical Archive, has quite a bit of material on the pilots who flew out of our region. I am always looking to expand our collection and knowledge base about the many pioneering aviators from Valdez; in many ways, these pilots invented the institution of Alaska bush aviation. Our summer exhibit, 'Skyboys of the Wrangell-St. Elias Range', is a traveling exhibit from the Anchorage Museum that we have augmented with our own permanent aviation display and materials from our own collection (you can view our web site for more details). I am greatly interested in acquiring more information about Nat Browne and other less-documented flyers who made Valdez a home. Any assistance you or anyone can provide is appreciated!" I came across this page in a book called 'Sourdough Sky' - 'Alaska * Bush Pilots * Interior'. A pictorial history of flights and flyers in the Bush country, by Stephen E. Mills and James W. Phillips.